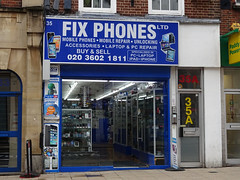 Mobile phone accessories and repair shop on George Street. It was previously a branch of Tate recruitment agency photo. As of August 2012, there was a sign in the window photo stating that "the office is now closed due to staff training". It wasn't clear when (or if) it would reopen. As of June 2013 the premises had been (mostly) stripped out and the Croydon branch was no longer listed on the Tate website. As of February 2014 the premises had been stripped out further, and the Tate sign had been removed photo. Still vacant as of February 2015. Last edited 2019-03-15 11:01:39 (version 42; diff). List all versions. Page last edited 2019-03-15 11:01:39 (version 42).